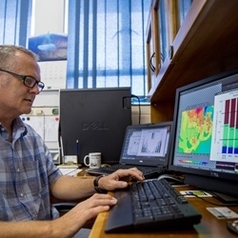 Prof Willem Landman, a CSIR meteorologist, specialises in the development of systems that have the capability to provide seasonal forecasts of mean weather conditions and characteristics associated with rainfall and temperatures, months ahead of their occurrence. Landman was only sixteen years old when he built his first weather station in his parents’ backyard. This interest was sparked when his childhood fascination with thermometers led him to read his brother’s university geography books, where he discovered meteorology. “I was hooked and sure of my future career path. To this day I still diligently record weather observations in my yard in the mornings. When I hear the wind howling during the night, I get a thrill to see a rise in atmospheric pressure on my barometer the next morning and when there was rain to see how much of it each of my three rain gauges has recorded,” says Landman who studied meteorology at the University of Pretoria in the late 1980’s and early 1990’s. Landman later spent more than 20 years at the South African Weather Service. After joining the CSIR research group for climate studies, modelling and environmental health in 2009, Landman developed new forecasting systems for seasonal rainfall and temperatures in southern Africa. He also developed forecast systems for global ocean temperatures. Landman also supervised several PhD and MSc students and assisted them to develop a range of operational forecasting systems, including a fully coupled ocean-atmosphere model for real-time seasonal forecasting. “The nature of my work at the Weather Service was of a more operational nature, but at the CSIR I had the opportunity to further enhance my skills in research science and have since become an NRF B2-rated scientist with more than 50 peer-reviewed publications in accredited journals. For me, the main challenge, initially, was to source part of my research group’s project funding externally. Landman believes that one of the main challenges in the field of meteorology in South Africa is to make sure that the forecasts generated by our state-of-the-art models are applied in such a way that they have positive societal impacts in order to improve people’s lives. “Our work should not only be about the number of publications that we generate or have a sole focus on the development and improvement of weather and climate forecast models, but we have to show that our outputs improve the lives of South Africans. Having access to and input from a multidisciplinary work force gives CSIR researchers an edge in this regard. According to Landman, meteorologists will increase their focus on applications of their forecasts and projections. In a recent project a PhD student, who was supervised by Landman, completed a thesis on the predictability of seasonal rainfall and water inflows at Lake Kariba, a large water reservoir which lies along the border between Zambia and Zimbabwe. The aim was to improve water resource management to boost water security in the region and it was funded by the Belmont Forum and ACCESS, the Applied Centre for Climate and Earth Systems Science. ACCESS is a consortium of several agencies, researcher councils, research programmes, universities and research groups who have combined efforts to deliver a range of outputs aligned to the Department of Science and Technology’s national plan for global change research. Landman and his colleagues at the CSIR have also assisted, through the provision of forecast output, with operational forecast systems development at the South African Weather Service, the University of Cape Town and the International Research Institute for Climate and Society at the Columbia University in the United States.